Marcelo Sabuc and supporters in Wolfville NS. 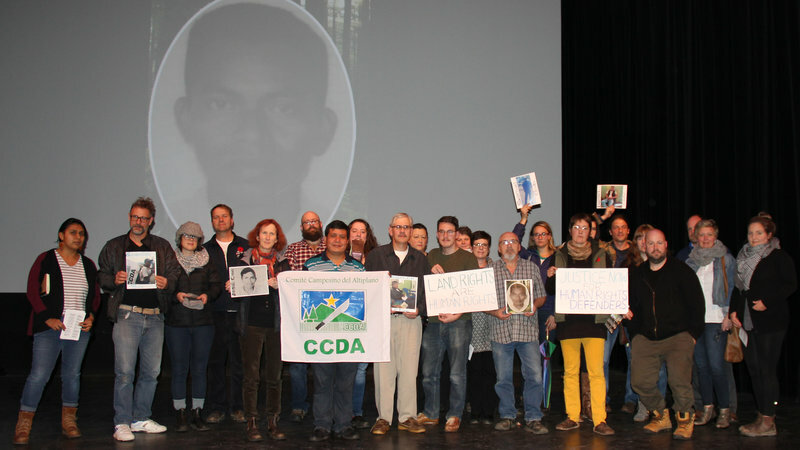 Presentation/Q&A of Marcelo Sabuc Xalcut, national coordinator of the Highlands Committee of Small-Farmers (CCDA) in Guatemala, building solidarity for circumstances where 21 human rights defenders have been killed this year amidst an escalating political crisis. These audio of Marcelo Sabuc, CCDA, from tour of Canada are posted for timeliness with both the Ottawa event November 14 (7pm at 233 Gilmour St) and Vancouver visit later this week. The presentation explained the work of CCDA, with 30,000 members, to grow food on the land for self-sufficiency and then if possible to sell for $ to re-invest in the farming as well as community education, health, etc. The CCDA has been successful in increasing their land holdings for various communities. Half of Guatemala’s population is in extreme poverty and malnourishment. In Guatemala, the mining, hydro-electric dams, and large agricultural industries create problems for communities, especially pollution and displacement. Corruption in the country is a huge problem and the current president works with narco-traffickers, corrupt business interests, and gangs/mafias, and is attempting large-scale changes of institutions to install and insulate his/their positions of power. There has been a wave of repression this year, especially in the spring/summer, that has left 21 human rights defenders killed. Friends of the Earth has recognized International Human Rights Defenders Day, and taken another in a series of measures to spotlight the REPSA palm oil case, by sending a letter signed by eight leading international environmental and human rights organizations, demanding that the Guatemalan government take concrete steps to ensure the safety and protection of Saul and other land defenders in the Peten. The letter also urges progress in the investigation into Rigoberto Lima Choc’s murder, the death threats against human rights defender Marco Antonio Mateo; the kidnapping and release of three other activists; and the investigation into the ecocide of the Pasion River.